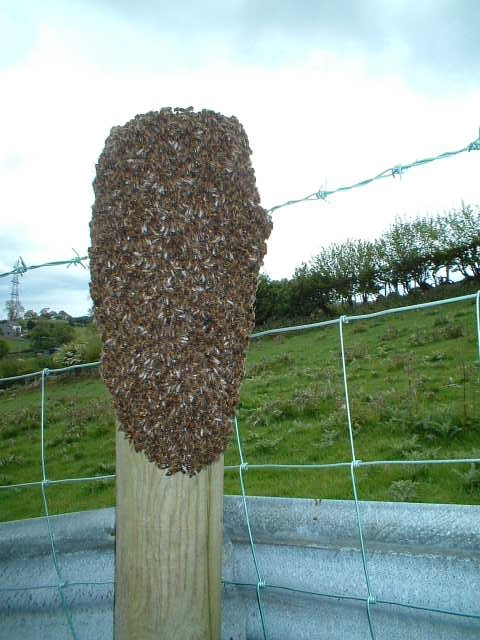 A list of swarm collectors in North Wales is here. Beekeepers may make a charge to cover travelling expenses. 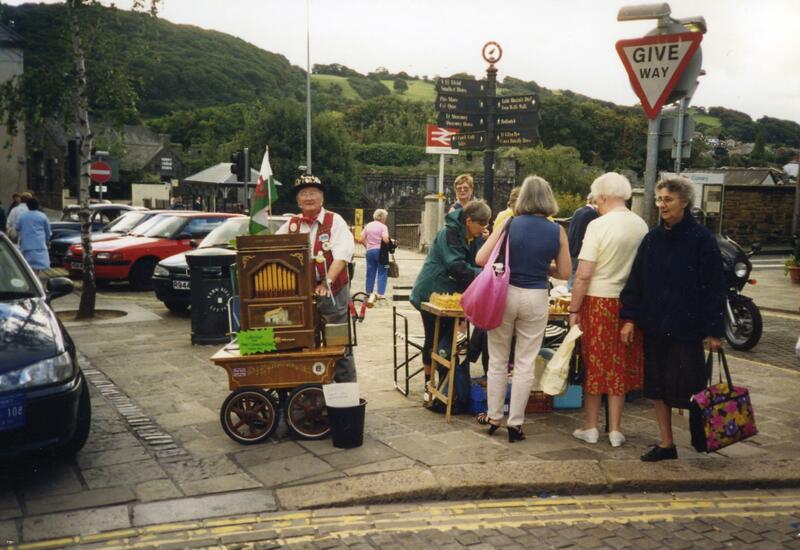 Please contact Carol Keys-Shaw at South Clwyd Beekeepers’ Association via their contact page http://bee.rapportcreative.co.uk/contact/. They have members in Corwen who may be able to help. Please do not even think of killing the bees. Hello we have a bee swarm in a hedge in our garden in Llanrwst. It is not a problem, but is anyone interested in removing them. If no reply then we will let nature take its course. Please contact Alan Wheeler tel: 642533 or Kevin Jones 643255 . This is most likely to be a bumblebee nest. (Bird boxes are too small for honeybees). Bumblebees do not sting and they are no danger to you or your dogs. 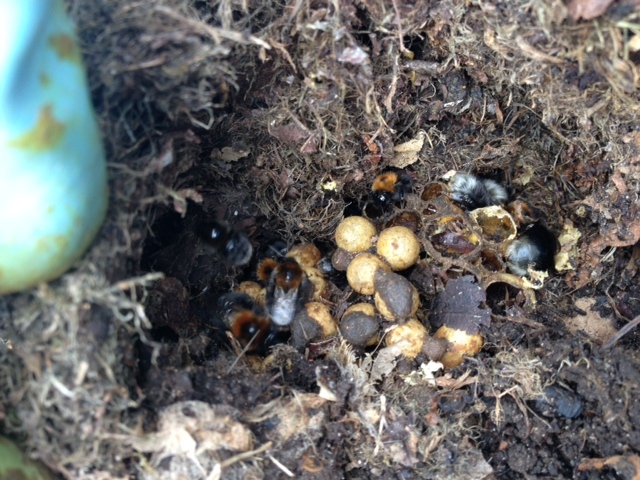 Please see information on bumblebees on our website page Nuisance Bees. Within the last day or two bees appear to have established a home in the roof of our house just above our balcony. I have read on this page that people are usually encouraged to live with them but my wife has a strong phobia of bees and wasps and living with them is just not option for her. Can anyone help or advise how we can get the bees to move on. We would certainly prefer not to have to kill them. Please see the list of beekeepers on our Nuisance Bees page. One of them may be able to help you. 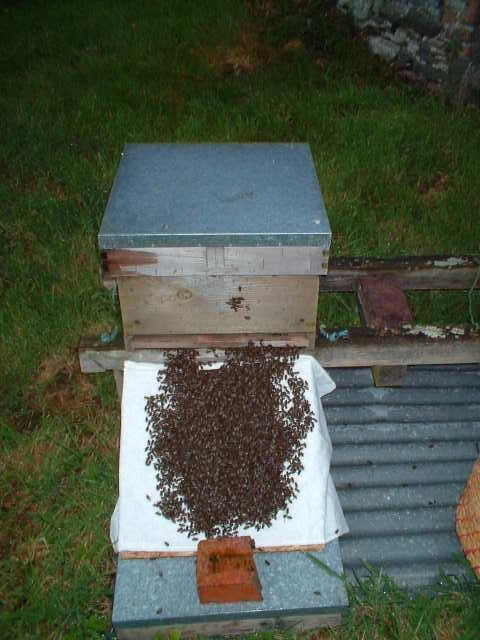 I have recently moved into a property in st asaph and i have noticed over a month now a good number of bees going in and out of my bungalow just near the roof its becoming a nuisance is there anyone who could give me some advice or removal as i have a 9 month old baby and don’t really want to risk having her out in the garden when so many are about. Please see our page Nuisance Bees. Scroll down and you will find a list of local beekeepers who can help you. Hi, I have bees entering the roof space of my bungalow in Llandudno. I have tried to block the entrances they have been using, but they keep finding new ones. Could somebody please advise me as to how I can discourage them from using my roof as their home. Please see the advice on our page Nuisance Bees, and the list of local beekeepers. I have a swarm of Bees taken residence in a bird house in my garden and I am worried they might sting my two dogs, they have been there for a month so I think they have decided to stay, I have checked them and they are not bumble bees, not wasps, if anyone can help I would be great full. I don’t want to kill them that would not be right. hopefully some one can take them and create a new hive for them. I suggest that if they’ve been there for a month without any problem they are OK to live with. Just enjoy watching them coming and going. They are unlikely to sting you or your dogs. Suggest you call on the neighbour selling honey and ask their advice. Bees in at our roof, for about 3 yrs but it needs to go to a new home not our roof. possible someone wants this bees, let us know please. thanks. Sorry, our members do not remove honeybees from a house roof. We always recommend that they are left alone. Hi there. I’m looking for some bees for my friend who has some land near Bangor. He has a small orchard he planted himself. A small amount of woodland and an area of wild flowers and plants. He is very eager to get some bees for his land and is quite prepared to take on a swarm. Although he works as a vet in Manchester he is in Wales every weekend, from Friday through to Monday as he only works a three day week. Please would you ket me know if this is possible. Thanks for your message re beekeeping in Bangor. We suggest your friend attends our next (free) meeting with the bees at Tal y Cafn in the Conwy Valley on Saturday 28th June to see if he is happy around bees, or attends a Meet the Bees session at the National Beekeeping Centre HQ, Furnace Farm, also near Tal y Cafn. 1. A local beekeeper places a few of their hives at the orchard, and uses the site as an “out apiary”, with your friend assisting and learning from the beekeeper. The orchard will definitely benefit from beehives nearby, no doubt about that! Please let me have your friend’s email address, and I will add them to our email newsletter address list. Hi, I live near Prestatyn. At the top of my garden I have a decking patio area complete with fixed seating and a fixed barbecue. A neighbour has just installed a bee hive about 8 foot away. As one who has a strong allergic reaction to bee stings, I have spent a lifetime trying to avoid them. Advice please. I’m sorry to hear that. We always urge beekeepers to be considerate towards neighbours. 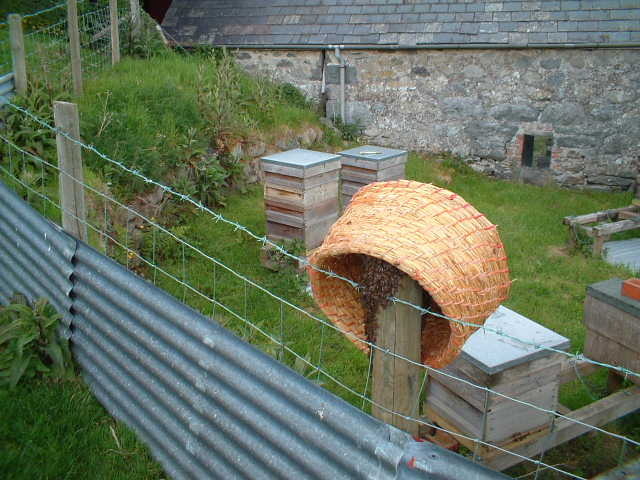 A polite word with them might help, especially as the beehive has only just been installed. They should be asked to relocate it. Some bees have taken over my shed and I’m unsure of what to do. They seem to have made a snug home in some fleece stuff that is used to insulate tender shrubs and plants in the garden over winter. In the spring I folded this up and put it on the shelf in the shed and now the bees go in and out of the layers and I’m frightened to go in the shed to get anything in case they have a go at me. I never kill anything if I can help it so don’t want to use sprays or insect killers but I could do with getting in the shed for things. I think it is unlikely that the bees will have a go at you. They have chosen your shed as their home, and it would be a shame to disturb them. Best just to leave them alone. Thanks for your reply – I’ll leave them alone – might I get some honey at some point? Also, when the winter comes on will they just die off? Sitting in the back garden and heard a sudden humming. Looked up to see thousands of multi-sized bees swarming. Was able to exit the garden without getting stung. Watched from a safe distance as they seemed to drift across a back pasture and out of site. Where did they come from and what precautions should I take to avoid getting stung? It’s quite a scary sight to see a swarm of bees in the air, but it’s nothing to be afraid of. They do not have a nest to protect and they are only concerned with finding a new home. They will settle on a tree branch after a few minutes, and form a tight cluster, about the size of a small rugby ball. If you see this you should alert a beekeeper, who will collect the swarm. The swarm will be sending out scout bees, looking for a suitable home, an old chimney, an empty beehive, roof of a house etc. They will stay in a cluster for maybe a day or so, then they will fly to the the new home. Hi was cutting my hedge when i noticed 15 to 20 Honey Bees ,near my bedroom window,i cant see any holes anywhere,but they are there again today ,is there any way i can spray them or enything else i can do to get shut of them ??? I understand that if they go, we go. Because of this I’m prepared to put up with the noise that the new residents of my roof make. However, the entrance via our soffit boards is just above our bathroom window which is an issue. Another issue is the fact that last night we left the spare bedroom window open and awoke to find nearly two dozen bees dead on the carpet and window sill. This we can’t live with, any advice please? Hi, I have a static caravan in Bala. We have a swarm of bees under our caravan. The problem is that they’re entering under our entrance door/kitchen window. It’s becoming problematic because they’re coming into the caravan. Is it possible for someone to come and remove them? Please see our website page Nuisance Bees which contains a list of beekeepers who may be able to help you. HI, just walked the dog by Clwydgate near Ruthin and saw what looked like a swarm of bees. Will you contact beekeeper Fiona Bell 0781 30887797, who may be able to help. It’s very late in the year for swarms of honeybees. Please note the number you have supplied for Fiona Bell is incorrect.